Synopsis: A sausage strives to discover the truth about his existence. Imagine Toy Story, but instead of a talking cowboy doll and spaceman, the main characters were a talking hot dog and bun. And instead of the world of toys come to life, the world of food takes on a mind of its own. That’s basically Sausage Party in a nutshell. Oh, and the food is raunchy, foul-mouthed, and borderline offensive at every turn. At its core, Sausage Party is about a grocery store filled with sentient food, all of which believe that being “chosen” by a human means they are moving on to some sort of nirvana. However, dissension amongst the steadfast belief has a few food items trying to figure out if the idyllic “Great Beyond” isn’t so great after all. The film basically serves as a type of food pun-filled theme park ride, with the story taking stops at all the expected aisles. 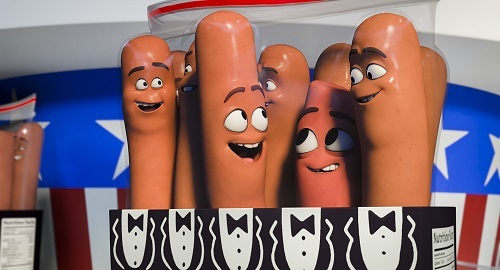 In a lot of ways, Sausage Party is the next logic step for Seth Rogen, who pulls the usual triple duty as the voice actor for the hot dog Frank, along with conceiving the story (with Evan Goldberg and Jonah Hill) and producing. Rogen and his group of comedic pals have always found ways to take a particular genre and make it their own, from the Christmas film to the disaster movie. Really, animation seemed like the next hill to climb, but of course, in that specific Rogen way. That means tons of stoner humor, lots of crude jokes and references, and a cast of talented comedians a mile long – among them Kristen Wiig as Frank’s love interest Brenda, Michael Cera as deformed hot dog Barry, and Nick Kroll as a “juiced” up douche (the literal women’s health aid). With a stacked voice cast and a story that feels familiar but has its own twists, Sausage Party needs only to execute on more of its jokes than it falls flat on. Luckily, the film is plenty funny from beginning to end, and will have some moviegoers uncontrollably laughing. There are truly some scenes in Sausage Party that are only possible because this is an animated film, but at the same time, it’s so bizarre to see cartoon food depicted and acting this way. Most importantly, though, Sausage Party‘s humor and creativity keep it going the whole way through, even as it treads some familiar territory for an animated film. There really are some strong similarities to be drawn between this and Toy Story, but then things take an unexpected left turn and you’re watching a late night rave hosted by alcoholic beverages. Although Seth Rogen has never shied away from acknowledging his drug use, this is the first film that feels like it was both written by people on drugs and that you are actually on drugs. It’s the type of manic fever dream that you can’t believe has been put to film, and that somehow you are laughing at what is some really juvenile humor. If the film’s basic concept doesn’t have you rolling your eyes, give Sausage Party a chance. It will no doubt surprise you in a million different ways. Make no mistake; Sausage Party isn’t going to be for everyone. 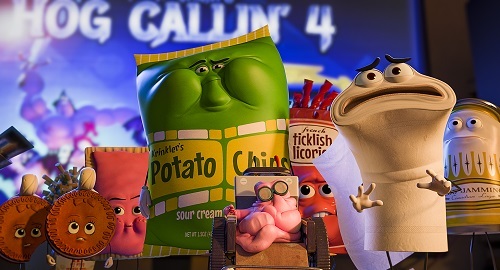 Some of the Seth Rogen crowd will decry that it’s an animated film and will have a hard time getting into the world of talking food. Similarly, those who are easily turned off by raunchy humor will find that Sausage Party never strays too far from teetering the R/NC-17 line. This is a film that takes advantage of its subject matter and art form to push the envelope, but pushing said envelope always comes at a price. That being said, if you’re not easily offended and you can buy into this world, then Sausage Party is wall-to-wall laughs. From the way the film cleverly plays with food puns and creates personalities for different types of food (like Jewish bagels, Nazi Dijon mustard, etc.) to the jokes made around talking food, there’s never a dull moment in the film. The writers truly put a lot of time and effort into finding creative and funny ways to leverage their concept, and Sausage Party does not disappoint when it comes to laughs…big ones at that.